This earth-friendly detergent is free of all polymers, petrochemicals and optical brighteners and will get your clothes as white as you mother's Arm & Hammer. There is no comparison to similar laundry liquids, which, while adequate at cleaning clothes, tend to leave whites slightly grey and barely make a dent in stains. I used them anyway, because I wanted a chemical-free product, but may never go back now that I have tried Biokleen. I have only used the citrus, which has grapefruit and orange peel extracts, but they do offer free and clear and cold water versions. 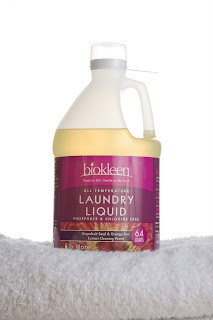 Biokleen is more expensive than the other earth-friendly brands, but is offered online in bulk or at lowered prices. It is also concentrated, so it goes a long way. The only downside to Biokleen is that you have to rinse the measuring cap after you use it, which is a minor hassle if you don't have a laundry sink. I do the rinsing thing, but it still stays goopy. Thank you so much for reading and posting a comment! My husband made me shamelessly promote myself and now I'm glad I did. Be well!